An uranium gun-type atomic bomb (Little Boy) was dropped on Hiroshima on August 6, 1945. 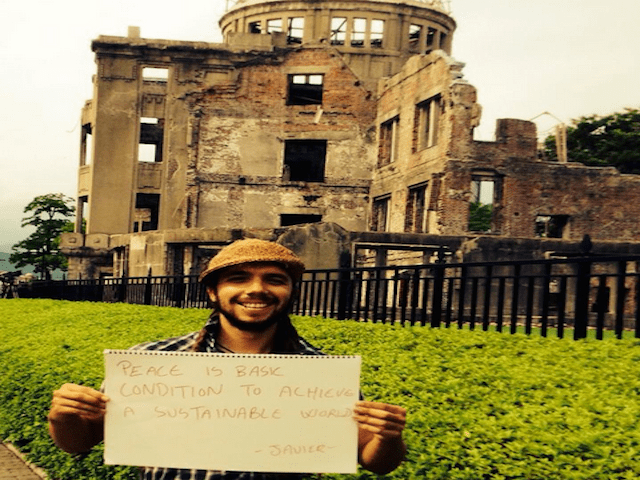 Javier Collado attended celebrations of Peace for 69º anniversary. It is urgent to develop the understanding, skills and values to cooperate in the resolution of armed conflicts still present in the 21st Century. There are not political boundaries for environmental degradation effects nor even for pathogenic microorganisms. We are global citizens ready to face current challenges from new civilization paradigms. Therefore, Global Citizenship Education proposed by UNESCO in the post-2015 Development Agenda has to be contextualized multidimensionally: from a transdisciplinary perspective, which takes into account the different levels of Reality. Recognizing complex plasticity of transdisciplinary Reality allows us to understand that we are part of this Reality that changes due to our thoughts, feelings and actions. This means that we are fully responsible for the structure of Reality. In these terms, the human race is facing the highest ethical and humanistic challenge they may have never faced throughout the history of their existence. There is not any corner in the world where the telecommunications revolution has arrived to show the embarrassing situations of war, violence, and inequality that devastated the face of the Earth in the 21st Century dawn. All earthly inhabitants are aware about the shameful and pitiful situation. Knowledge makes us responsible. The ethical responsibility and commitment are, inexorably, universals. A planetary and multidimensional reformulation of ethics is necessary. A new ethic based on the balance of spiritual-inner and material-outer people knowledge. Therefore, the contemporany and future ethical commitment of world-society is, undoubtedly, the promotion of a consciousness of unity with all life. This is because an ecological consciousness is, at the same time, a spiritual consciousness. At this deepest level of Reality, ecology merges with spirituality, because the experience of being connected to all nature and the universe is the essence of spirituality. In our human genetic code can be found evidence that we are as ancestral as the universe itself. Every cell of our body contains the reminiscent energetic vibrations of the Big-Bang. If we want to ensure a sustainable future, we must strive to understand the multidimensional aspects that constitute humanity. In this sense, cosmodern consciousness derived from the transdisciplinary vision recognizes the inter-relatedness, interconnectedness, and indivisibility of the cosmic system in all its dimensions: from quantum particles to the most distant galaxies. Atomic particles that comprise astrobiologically the human species do not understand materialistic ideologies, religious dogmas, nationalism, or any economic greed. For this reason, the process of safeguarding humanity from war and violent conflicts requires the cosmodern paradigm emergency. A new paradigm that abandons one-dimension and linear structures of thought and understand all life forms as a vast cosmic matrix of energetic phenomena in constant motion. This is where differentiation, diversity, and contradiction occurs at different ontological levels of Reality. So, dear readers, I invite you to reflect seriously about the future human evolution on Earth, inserted in this cosmic dynamics, to begin to irradiate an inner energy that enables us the creation of new autopoietic and peaceful ways in all form of life composed by quantum chaos. A future evolution of human existence that makes sense when you look into the eyes of our children and grandchildren, because they give us the strongest energy existing in nature: LOVE. And is not this the most powerful weapon to promote a culture of peace in defense of human rights capable of achieving sustainable development?